Harry's Battalion arrived in France in April 1915. They had to wait until June before they were called into action. On 22 April 1915, German troops advancing westward from Langemark had attacked the French troops in Boesinghe with gas bombs. This was the first large gas attack in military warfare. International Trench, Farm 14 (Moortelweg) and Fortin 17 (150 metres north of the crossroads Moortelweg – Kleine Poezelstraat). The fighting lasted for four days and is recorded in British regimental history as "a small but successful operation". During the period 6th – 9th July and the following days the encounter was so violent and the casualties so numerous, that other units were called in for support. Between the 6th and 11th July 1915, 366 British soldiers lost their lives at Boesinghe. On the 11th July Harry's Battalion, the 1st/4th Y&L, relieved the 1st/5th Y&L due to their severe losses. He was killed the next day along with three of his comrades. 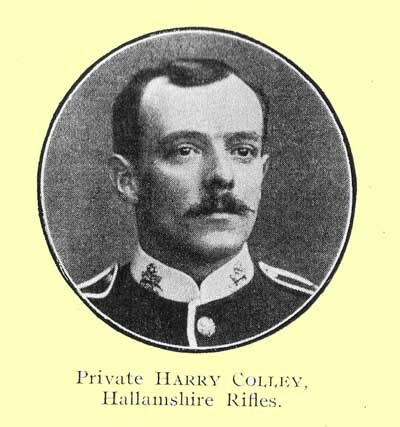 Harry was buried in Talana Farm Cemetery in Boesinghe and is remembered in Burngreave Cemetery in Sheffield.